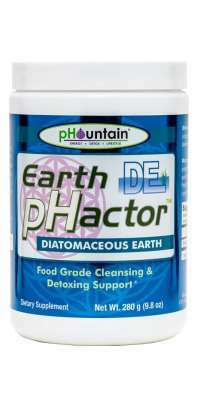 Earth pHactor (DE) is a silica-containing powder made from the shells of ancient marine plants. Silica plays a critical role in keeping the body nourished and healthy. It helps bones absorb minerals, especially vitally important calcium. Further, when calcium levels are insufficient, your body can turn silica into the calcium your bones and joints need to remain strong and healthy. Additionally, Earth Factor’s food grade DE may help to “flush” the intestinal tract, assisting in the removal of toxins. Many people report healthier hair, skin and nails following consistent use of Earth pHactor.